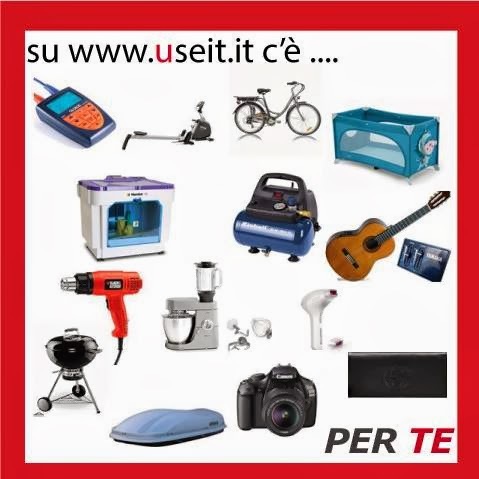 SHARING ECONOMY arrives in Italy: I say "hey, yay"! The Economy of Sharing arrives in Italy... finalmente! Today LabSpace would like to introduce you to a revolutionary, environment-friendly, concept: stop buying! Share what you already have, and save--- on money, on resources and on waste. USE IT. Basta comprare, basta sprecare! Diventa consapevole e discernente: condividi ciò che già possiedi. Risparmia denaro e risorse, riduci lo spreco. USE IT: usalo. It's now time to give meaning to all those things you've got lying around the house: costly objects you bought years ago and probably hardly ever use: maybe it's the funky bread-baking machine, or camping equipment, or a musical instrument? Wouldn't it be great if you could lend your possessions to someone who needs it for a short period, and earn something in return? E' ora di dare un senso a tutti quegli oggetti che hai in casa, stipati negli armadi o in fondo alla cantina: oggetti forse costosi, acquistati tempo fa, e che non usi (quasi) mai. Forse è la macchina per fare il pane, l'attrezzatura da campeggio, uno strumento musicale? Non sarebbe bello se potessi prestare le tue cose a qualcheduno che lo userebbe per un po', e guadagnare qualcosa in cambio? Now imagine also being able to borrow, say, some disco equipment for that party you're throwing next Saturday without spending any money at all! Or finding someone who could translate into French that love letter you want to send to your girlfriend in Paris. Now you can, with useit. 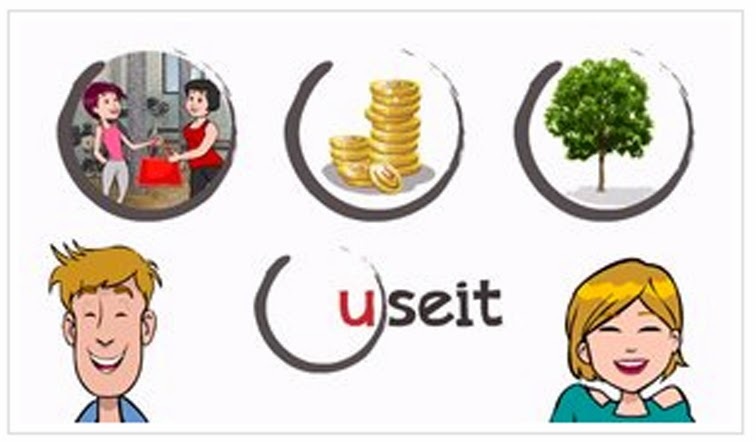 Useit works with a virtual currency called u-coins, that enables its registered users to carry out transactions without using actual money. Immagina poi di poter prendere in prestito ad esempio una attrezzatura da discoteca per la festa che farai a casa sabato prossimo, senza spendere nulla. O di trovare qualcuno che può tradurre la tua letterina d'amore in francese. Ora puoi. Con useit. La piattaforma usa una moneta di scambio, lo u-coin, che consente agli utenti di effettuare gli scambi senza usare denaro. Some time ago I wrote a little illustrated piece about what happens to my little pouches once I separate myself from them. 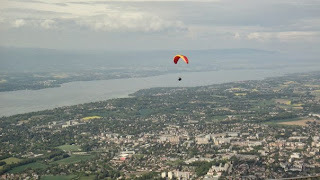 Here is the article (where you have met with Monica in Chamonix, Charlie in London, Guy in the Far-East, Margherita and Isabella in Rome, Sabrina in Geneva, Greta in Texas, Angela in Vancouver and Ilaria in Turin). Today I would like to dedicate an entire chapter to one of my biggest fans and LabSpace supporters: Ayesha Baumgartner. This international and multi-talented woman, model, actress (click on the "voice animation" button top right to hear the amazing voices she is able to produce), martial arts instructor, and extensive world-traveller, is the founder and director of the Montreal-based Kids Act 2 Drama Club in Canada. She directs her charismatic environment-consciousness towards educating children to a socially-aware and green attitude. I am pleased and proud that she has found her LabSpace pouches to be useful in many different parts of the world during her globe-trotting. 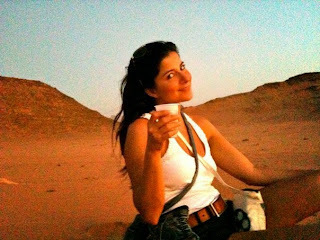 Here she is in the desert in JORDAN. Ayesha found her "MOVIE FRAMER" pouch handy for keeping her small belongings close at hand, and used her "BOTTLE" pouch for stylishly carrying her water bottle on her. Her "HEY MR.COWBOY" hip-pouch was securely fastened to her belt, so she actually had three different pouches on her at any one time for carrying all her things, hands-free. 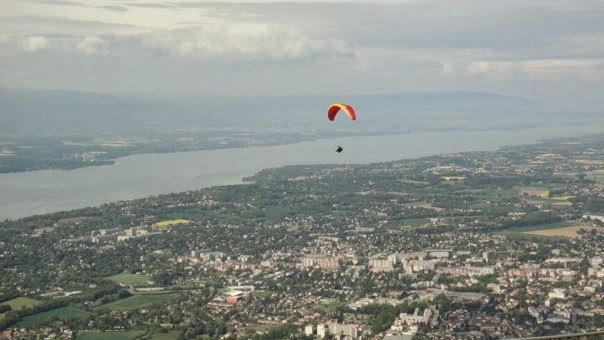 And just guess how this intrepid woman came down from the Swiss mountaintop?...Well... she took the shortest way down it: VERTICAL. Very nice Easter surprise for me: thank you so much Etsy Italia Team for publishing my interview. I love belly dancing. You don't have to be good at it. It is one of those things a woman can just treat herself to: to embrace and celebrate her own femininity wholeheartedly, with no "if"s or "but"s.
You don't have to be thin: in fact, if you have some extra body fat it actually looks better! The more you shake and wobble, the better. You don't need to know how to dance: you won't be needing the splits, or any extra talents at all. You'll just gradually discover just how many parts of your body you can isolate and move. You don't have to be fit: you'll be building your capacity very gradually. You're never too young, nor too old for it: it's for all ages. My 6-year-old daughter sometimes joins in, and some women in my class are probably over 60. And soon you'll be freeing yourself from the slavery of our modern-day woman ideal: necessarily tanned, necessarily toned, anonymously and septically perfect. No no no. Soft is beautiful, shapely is beautiful, pale is beautiful. Female, in all its femininity, is beautiful. We have (somehow?) sort of forgotten that--- haven't we? Now this below is a video of the Veil Dance we did in June. Not what you typically expect when you think of belly dancing, but one of the things you discover along the way is that there are so many possible variations on the theme. Try it to believe it! You were extracted by my little Winner-Chooser-Fairy! Thank you so much everyone for participating in my giveaway. One day not so long ago I had a friend who was sad: she said she was having a bad time and feeling rather down and dejected. So I was inspired to make this pouch, that could express happiness and optimism on one side, and discouragement and worry on the other. It happens to everyone I suppose. There are YES days, and NO days. But remember, you won't ever be stuck "down there" for long, if your outlook is positive. Pacman used to be my favourite electronic game when I was a little girl. I remembered that because a few days ago it was Pacman's anniversary and Google had it on the frontispiece. 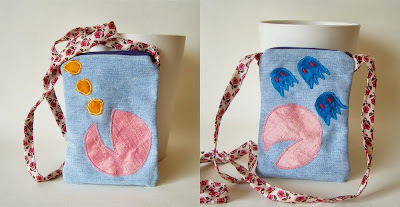 So instead of making a smiley-face/sad-face pouch as I had planned, I made a smiley-pacman pouch. So I also got to embroider the dots (they actually turned out to look more like chicken nuggets), and the little blue munchy monsters chasing Pacman. This is another one of my typical iPouches, or cellphone carrier pouches. Made with 99% recycled materials, from leftover scraps, and old clothes, and vintage fabrics my mother-in-law gave me from her own mother's old closets. 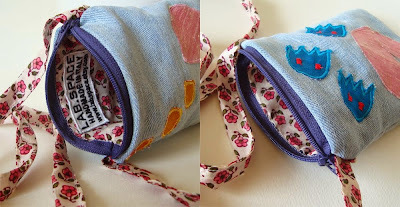 I like the inside of the pouch to be a little surprise, so I usually play on colour contrast. 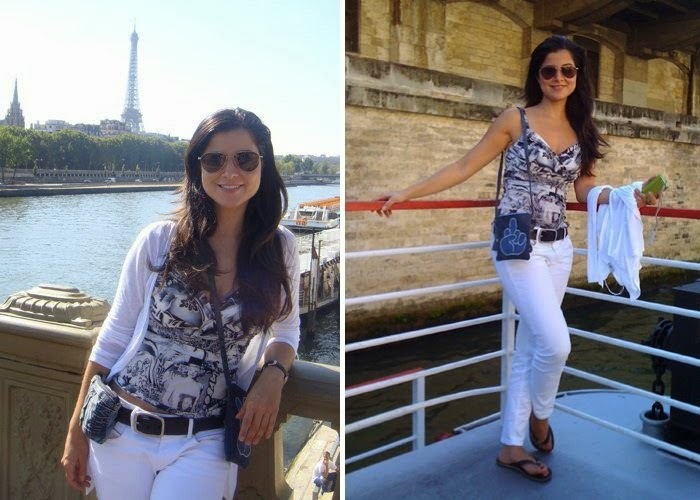 In this case, the lining is made of the same fabric as the shoulder strap. So guess what: cheer up, and continue playing the game! The HOTTEST, most "hearted" item of my Etsy shop! Don't miss this unique giveaway. It's easy. Just spot the fabric... tell me... and then hope luck is on your side. La creazione più "cuorata" del mio Etsy-negozio. Non perdere questa occasione. E' facilissimo. Individua la stoffa... comunicamelo... e incrocia le dita. and tell me which of my bags you think has recycled some of the leftover fabric from this dress. e dimmi quali tra le mie borsette, secondo te, contengono pezzetti di stoffa avanzata dalla lavorazione di questo vestito. 1. Go to my Etsy Shop by clicking right HERE, and look at each item one by one so that you can see it enlarged and better spot the fabric we are looking for. Vai al mio Etsy Shop cliccando QUI, guardati ogni articolo aiutandoti anche con le foto ingrandite e trova la stoffa che stiamo cercando. 2. Make a note of the name of each pouch you think bears traces of this material. (If you like an item particularly, please give it a heart, that is always greatly appreciated. Of course if you cannot resist and wish to purchase it, feel free, I will not be upset at all, and you will naturally still be entitled to win the Sakura Pouch). Annota il nome di ogni borsetta che secondo te contiene frammenti di questa stoffa. (Se un articolo ti piace particolarmente, un cuoricino e' sempre gradito. Naturalmente se non puoi resistere ad un acquisto, nessun problema, non mi dispiaccio mica, anzi, e non sarai escluso dai candidati alla vincita per il Sakura Pouch). so please also mention that in your comment. Avrai punti aggiuntivi se ti iscrivi al mio Blog (o se blogghi su questo giveaway), mi segui su Twitter (o Tweeti di questo giveaway), diventi il mio fan su Facebook (o pubblichi la notizia ed il link di questo giveaway) e/o aggiungi il mio negozio tra i tuoi favoriti Etsy, quindi segnalami tutte le azioni che avrai intrapreso. 5. Entries deadline: Tuesday 22nd June 2010, 18:00 Roman time (=GMT+1hour). Winner will be announced Friday 25th June 2010. Il concorso e' aperto fino al martedi 22 giugno 2010, ore 18 italiane. Il vincitore sara annunciato il venerdi 25 giugno 2010. ANYONE can enter this contest (the only condition is that your answer must be posted in the comments of this blogpost), so spread the word and tell all your friends about it. Blog about it, Tweet it, FaceBook it, email the news to whom you wish, and anything else you can think of which may not have occurred to me as I write. CHIUNQUE puo' prendere parte a questo gioco (basta che pubblichi la sua risposta nei commenti di questo blogpost). Passate parola e ditelo a tutti i vostri amici, tramite Blog, Twitter, FaceBook, email, e qualsiasi altra forma di comunicazione vi venisse in mente. In bocca al lupo, e buon divertimento! 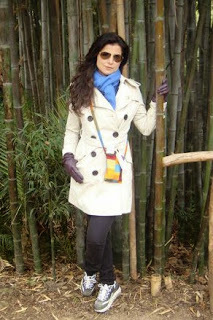 Hello, my name is Rachel, I am an architect, mother of 5, and live in Rome, Italy with my wonderful big family. "Creation" for me is an attitude towards life: always seeing the best in things and making the most of what you have been given, whether good or bad.